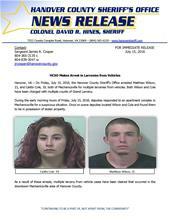 Hanover, VA – On Friday, July 15, 2016, the Hanover County Sheriff’s Office arrested Matthew Wilson, 21, and Caitlin Cole, 19, both of Mechanicsville for multiple larcenies from vehicles. Both Wilson and Cole have been charged with multiple counts of Grand Larceny. During the early morning hours of Friday, July 15, 2016, deputies responded to an apartment complex in Mechanicsville for a suspicious situation. Once on scene deputies located Wilson and Cole and found them to be in possession of stolen property. As a result of these arrests, multiple larceny from vehicle cases have been cleared that occurred in the downtown Mechanicsville area of Hanover County. “I am exceptionally proud of our deputies. Due to their quick response and thorough investigation, multiple cases have been cleared and we have been able to retrieve and return property to several victims,” said Colonel David R. Hines, sheriff. Investigators continue to work diligently to process recovered property. Anyone with further information about these incidents is asked to contact the Hanover County Sheriff’s Office at (804) 365-6140 or the Metro Richmond Crime Stoppers at (804) 780-1000. Citizens can also text Crime Stoppers at 274637 (CRIMES), using the keyword “iTip” followed by their tip. Both Crime Stoppers methods are anonymous.